A challenge for manufacturing, warehousing and R&D facilities is avoiding costly shutdowns and delays because of unclean workspaces that contaminate production areas. It is vital for these types of businesses to keep their facilities in a good state of repair and a clean work environment so that production continues in an organized and efficient manner. Buildings with this type of equipment require a commercial industrial cleaning specialist that has the experience and know-how to work in this type of environment. 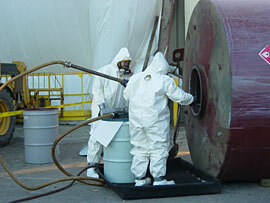 Special processes, equipment and chemicals are often used in industrial cleaning. 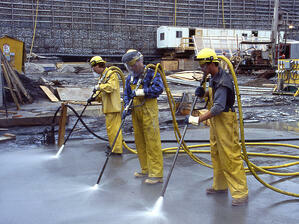 This requires qualified, trained and knowledgeable people to perform these services. Manufacturing facilities are on tight deadlines. Delays and shutdowns waste money and can destroy the bottom line. In order for a manufacturer to meet its production goals, an industrial cleaning service cleans the facility when the production line is down for scheduled maintenance or offline. This requires careful planning and may require a service that is available to clean your facility at odd hours. A professional industrial cleaning service needs to have employees that are well trained for working in these kinds of facilities. For companies that generate hazardous waste it is important to work with a company that not only has the ability to clean your facility, but is licensed and qualified to dispose of your hazardous waste streams, including those generated during the cleaning process. Industrial building cleaning is a specialized service that can work in a facility that manufactures such items as pharmaceuticals, building supplies, household items, chemicals, cosmetics, food processing, electronics, packaging, general manufacturing or more. Cleaning methods can include pressure washing of industrial tanks, vacuum pumping of wastewater and decontamination services. Look for companies that use bio-degradable cleaning agents when possible to avoid adding additional hazardous waste into the eco-system. When you are looking for the services of an industrial cleaning company, it is important to get an estimate of the work to be performed. Depending upon the type of work, it may involve a pricing structure that is customized to your facility and equipment, the square footage or the amount of work that needs to be done. Most commercial cleaning services that handle this type of work will provide free estimates and may also offer a contract for services. It is important to verify the company has the necessary insurance documents to cover its employees and the work being performed, and if dealing with hazardous waste has the proper state and federal licensing including EPA, DTSC (State of California) and Department of Transportation. Ask for insurance verification for both workers compensation and general liability, along with a list of at minimum three valid references.